This race report is dedicated to everyone who came out this weekend and made it such a great event. There is a huge difference when you travel 10 hours waiting in the hotel for your race to start or when you are driving 2 miles from your house to the race venue and feel at home because you see so many familiar faces who are cheering for you. HUGE DIFFERENCE!!!! Clarendon Cup was a brutal race: 50 laps, fast, hot, and technical. It was probably the hardest race I have ever done. I was so exhausted after 20 laps, I wasn’t sure if I had the energy to finish the race. Although there were times when the peloton got slower that didn’t mean any recovery for me. 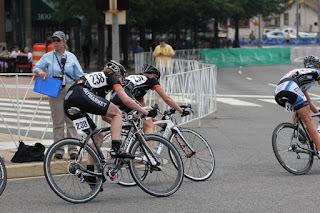 That was the only time I could move up so I could allow myself to lose spots during the parts of the course where I was not as strong as the other girls and still would be in the group. There were several times that I got separated by the peloton and I had to dig deep to get back on. If I hadn’t heard my name yelling on the course, I probably wouldn’t have been able to push myself so hard! Thank you so much, guys, for cheering!!! Crystal City was different, not as technical and easier to move around and not as fast. The two top teams, Colavita and Tibco, played the attack-counterattack game the entire time. At some point, when one Colavita and one Tibco girl were up the road, the announcer called for a field preme the next lap. I was sitting in the back and thought it would be actually pretty cool to go for the preme. One lap to go and everyone got antsy. I was not able to get into the front and basically had to work myself up on the last straight away when it was way too late. But again, the atmosphere of the race event was great. It made it to a awesome race weekend. Congrats to Lindsay for an amazing 7th place!!!! Looking forward to Tour of Washington County! I'm a big fan of free socks. Sounds like an awesome weekend of racing against some of the fastest women around. Congrats on hanging tough once again, and on winning a preme!